I spent a couple of days last week learning about the nuts and bolts of the new suite of psychometric testing tools my company has recently purchased. Very impressive they are too! I challenged Brenda to put up some evidence that testing tools were fake science but haven’t had a response as yet. And of course she will struggle because the science is long established and proven. The suggestion from the article is that using testing as part of restructuring is a new and sinister trend. I would suggest this is nonsense. 12 years ago I went through a massive company merger and, as an HR professional, was made to attend a whole day assessment centre to determine whether I had the right stuff for the new organisation. I made it through, some of my colleagues didn’t. They took redundancy. We all knew what we were up against. Obviously the right tools have to be selected, and then used properly by trained professionals alongside other assessment methods including interviews. Taken out of context, any question in a cognitive or personality test can be made to sound ridiculous and if Brenda was asked whether asking someone if they like opera singing is a good way to decide who is redundant then of course she is going to say no. What the writer of the article failed to grasp and what any HR person would have told them if they had asked, is that you use the tools to decide who will get the new roles that are available based on the job profile NOT who is the best person to get chopped. There is a clear and very important difference in my view. Any organisation that did the latter would be deserving of criticism and I doubt that the two departments mentioned fall into that category. Of more concern to me is that the head of New Zealand’s largest workplace union seems to have such a negative, outdated and ill-informed opinion of tools that form such a major part of the modern workplace through the recruitment and development of people across most organisations. But perhaps I’m just an elitist snob? Ah yes, you can’t beat gut feel for a major recruitment decision! No surprises here, except perhaps I would have expected a more balanced view. Yes, psychometric testing has been around for a long time, but you well know there are countervailing views about its efficacy as a tool to support recruitment decisions. I would have expected to see some acknowledgement of that. The PSA is publishing its views in the next issue of the PSA Journal, alongside releasing information about the very high costs of this form of testing in the public service. I urge you to read what we have to say, which includes members’ experiences of testing and how it is used. 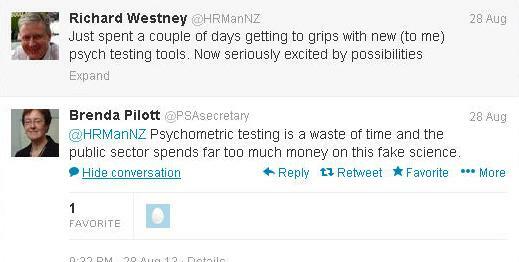 Interesting, I would like to see what she has to say and how testing is used in the public service. I’m not sure it’s possible to discuss ‘countervailing views’ in 140 characters though!